Once in a while, when I want to read a YA book, I look around to see what others are reading. Sometimes I ask Kelly from KellyVision for recommendations. Kelly has probably read all the YA books which are in print and the ones which are expected to come out in the next few months. When she recommends one book above all else, you know that it is going to be a sure winner. 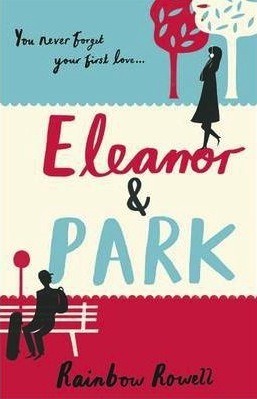 Kelly was recommending Rainbow Rowell’s ‘Eleanor and Park’ to everyone, sometime back, and so I thought I will read it. I finished reading it today. Here is what I think. Here is what the back cover of the book says about the story. Park is the boy at the back of the bus. Black T-shirts, headphones, head in a book – he thinks he’s made himself invisible. But not to Eleanor…never to Eleanor. They agreed about everything important and argued about everything else. She could hear her dad in the kitchen and her heartbeat everywhere. There is a description of Eleanor and Park holding hands for the first time, which was one of the most beautiful in the book and one of the most beautiful that I have read. It totally encapsulated the experience of falling in love for the first time. (You have to read it yourself and tell me whether you agree with me.) The book talked about mix tapes which made me nostalgic. Mix CDs somehow don’t have the same romance attached to them. Mix tapes – that was a beautiful, golden era. The book was hurtling towards a sad ending, as the best love stories often do, but Rainbow Rowell offers a ray of hope to Eleanor and Park and to us, the readers, in the end. You will have to read the book to find out what exactly happened. I loved ‘Eleanor and Park’. It is a beautiful story of first love. If you like YA romances, you will love this. You can find Kelly’s (from KellyVision) gushing review of the book here and Ana’s (from Things Mean a Lot) gushing review here. Have you read ‘Eleanor and Park’? What do you think about it? 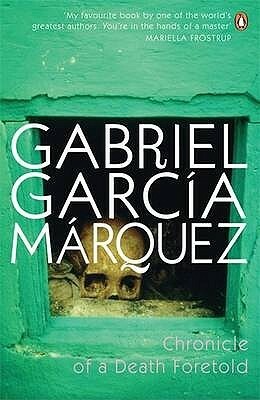 I have read probably one or two short stories by Gabriel Garcia Marquez but somehow have never got around to reading one of his novels. Even when my book club decided to read his most famous book ‘One Hundred Years of Solitude’, I couldn’t get around to reading it. Luckily for me, a few months later, my book club decided to read his novella ‘Chronicle of a Death Foretold’ and this time I thought I will read my first Marquez book. It is a slim book – the edition I read had 122 pages – and I finished reading it in one sitting. Here is what I think. ‘Chronicle of a Death Foretold’ is about the events which happen in a small town. A young man, Santiago Nasar, is murdered one day morning. The story recounts how and why that happened. Angela Vicario is engaged to marry Bayardo San Roman. They get married and on their wedding night Bayardo discovers that Angela is not a virgin. He takes her back to her parents’ home and abandons her there. Angela’s brothers beat her up and ask her to reveal the identity of the man who deflowered her. She says that it is Santiago Nasar. Santiago Nasar is a young man who lives in the town and no one has seen him and Angela together. So it is not clear whether Angela is telling the truth. But her brothers believe her. They decide to kill Santiago, which according to the culture of that town, will restore Angela’s lost honour. The rest of the book is about how this happens. The story is told by an unnamed narrator, who seems to resemble the author Marquez himself (the narrator mentions his aunt Wenefrida Marquez in the last page), which makes us think whether this was a real story which happened in Marquez’ town when he was younger, or whether this is a fictional story in which the author is the narrator or whether the narrator is fictional and it is pure coincidence that his second name and that of the author’s are the same. The story is narrated twenty years after the events in it happened and the narrator tries to piece together the events and discover the truth by talking to different people. Different people whom the narrator talks to, describe the events from their own perspectives. It is not clear till the end whether Angela’s accusation against Santiago is true. I was hoping that the author would introduce a twist into the tale and would blow my mind by revealing that the narrator was the real perpetrator of the ‘crime’, hence turning him into an unreliable narrator (What will the poor writers do when readers like me use their feverish imagination and keep demanding stuff like this? J) But it was not to be. The truth is not revealed till the end. I had mixed feelings about this book. Many readers would find the honour killing part of the book quite repulsive, with good reasons. Eventhough it was unpleasant, I didn’t have a problem with that, because such things keep happening even today and though reading about it makes me angry and indignant, I also feel that Marquez was just describing something which happened or which was in vogue in his country. But I was hoping that because the book was highly rated, there would be beautiful sentences, passages with deep insights, and something magical in the book. I read a Jorge Luis Borges story called ‘The Other’ sometime back and it gave me goose bumps and my heart was glowing with pleasure that when I went to bed that night I was thinking about it and couldn’t sleep for a long time. I was hoping and expecting that Marquez would do that to me – make me lose sleep, because my heart was glowing with happiness – but unfortunately, the book didn’t do that. It was a straightforward narration of events with nothing special. In a sense, it was a disappointment, but that was probably because of my own high expectations. I hope to give Marquez another try again in the future without any expectation and see whether the next book works for me. Have you read ‘Chronicle of a Death Foretold’? What do you think about it? After reading Annie Ernaux’ Simple Passion, I read somewhere that that book was similar to Marguerite Duras’ The Lover. So, I thought I should read The Lover sometime. Recently while thinking of new French novels to buy, I discovered that there was an omnibus edition which had four of Marguerite Duras’ novels in it – The Square, Moderato Cantabile, 10:30 on a Summer Night and The Afternoon of Mr.Andesmas. Four novels in one book – how can one resist it? I also remembered that Caroline from Beauty is a Sleeping Cat had recommended Moderato Cantabile and 10:30 on a Summer Night and Moderato Cantabile was also one of the featured books in Lance Donaldson-Evans’ One Hundred Great French Books. So, I had to get this collection. I got it last week and finished reading it yesterday. Here is what I think. 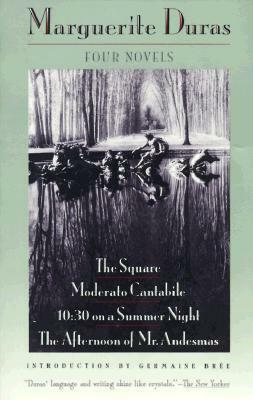 All the four novels featured in the collection – The Square, Moderato Cantabile, 10:30 on a Summer Night and The Afternoon of Mr.Andesmas – had one common narrative technique. Two strangers, typically a man and a woman, met accidentally in a place – a park, a café, a bar, a meadow – and started a conversation. The rest of the book was the conversation. Sometimes the conversation happened over a few hours. Sometimes it got interrupted and continued the next day and went on like this for a few days. So, most of these books were filled with conversations and dialogue. This is the kind of narrative technique which is irresistible for a reader like me. So, I totally loved the format of these novels. Now on the individual novels. The Square features a travelling salesman and a housemaid who meet accidentally in a park. They sit at the opposite ends of a bench and strike up a conversation. They talk about their lives and experiences which touched them deeply. The maid wants to change her life, but she feels that she can do it only if she gets married. The salesman is indifferent to his life and has accepted it. He enjoys travelling and the experience of discovering new cities though he doesn’t think much about his job. How this accidental meeting touches these two people and brings subtle but important changes to their perspectives on life forms the rest of the story. Moderato Cantabile is about Anne who takes her son every week to a piano class. One day, at the café opposite the piano teacher’s house, a man shoots and kills a woman. After the class Anne strikes up a conversation with a bystander and discovers that the man and the woman were lovers and the woman was already married. It is not clearly known why he shot the woman. Some people say that she asked him to shoot her and he did it out of love. The next day Anne takes her son for a walk to that place, enters the café and has a glass of wine. A stranger sits next to her and Anne strikes up a conversation with him. They talk about the dead woman and her lover who killed her and who has now been arrested. This stranger buys Anne more wine. After a while Anne leaves, but she comes back the next day. The stranger waits for her. They have wine together and continue their conversation. They continue talking about the two lovers, one of whom is dead. The stranger says that they probably met in a café like this and started having a conversation accidentally which later turned into love. After a while we the readers start getting the feeling that Anne’s life starts resembling that of the dead woman more and more – she meets a stranger in a café and has a conversation, she starts going to the café regularly and the stranger waits for her and buys her wine and the continue with a conversation, and they start feeling a connection. Anne is also married to a wealthy man and she has a son. What happens next? Will this all end well? Will Anne’s life really mirror that of the dead woman? The answers to these questions form the rest of the story. 10:30 on a Summer Night starts with a scene which is very similar to the main theme of Moderato Cantabile. There is a woman who is sitting in a café and she has a glass of wine while having a conversation with a stranger. The stranger tells her about a murder that has happened in the town recently. A young woman has been shot and killed by her husband Rodrigo. When I reached this point of the story, I couldn’t wait to find out whether this was another version of the story told in Moderato Cantabile, but told from a different perspective. But, at this point the story changes direction. This woman, Maria, goes to the hotel where her husband Pierre, her daughter and her friend Claire are waiting in the lobby. Maria senses that Pierre and Claire are in love, but they try to hide it from her. She is unsure of the future. That night because of the storm which is passing over the city there is no power and everything is dark. There is a murderer afoot as Rodrigo hasn’t been caught by the police yet. There are policemen everywhere waiting to nab Rodrigo. Maria is not able to sleep at night, while everyone else is sleeping soundly. She suddenly sees a humanlike form on the opposite roof. She realizes that it could be Rodrigo. She calls him gently. After a while he responds by getting up and waving his hand. Maria asks Rodrigo to wait, goes out, gets her car, goes to that building entrance and asks Rodrigo to climb down from the roof and come down. He comes down and hides in her car. Maria beats the police patrol and drives out of the city into the countryside. She parks near the fields and Rodrigo gets out. They have a short conversation. Maria tells him that she has to go back to the hotel. She says that she will come back by around noon and get him and then they can leave the city. Rodrigo nods and then goes to sleep in the fields. Maria goes back to the hotel. Is Maria able to come back and get Rodrigo? Is Rodrigo able to escape from the police? Does anything happen between Maria and Rodrigo? What happens between Maria and Pierre? Do Pierre and Claire get together? The answers to these questions form the rest of the story. The events of The Afternoon of Mr.Andesmas happen across an afternoon. Andesmas is sitting in his chair outside his home which is there on a hill, dozing away the afternoon. He has an appointment with Michel Arc who is expected to come and discuss with him about building a terrace for his house (his daughter Valerie wants the terrace) but Michel hasn’t arrived. After a while a dog passes through the place, tries to be friendly, wags its tail and then leaves. Then Michel’s daughter comes and tells him that Michel will be late. Andesmas waits for hours but Michel still doesn’t arrive. Then Michel’s wife arrives with the same message – that Michel will be late. She then comes and sits next to Andesmas and they have a conversation. The story continues in this vein till the end. Michel doesn’t arrive till the end. I liked the first three stories in the book very much. The Afternoon of Mr.Andesmas didn’t have the same kind of impact on me. It was probably because it made me think of Samuel Beckett’s Waiting for Godot where two people wait for Godot and nothing happens on the stage and Godot doesn’t arrive till the end. My favourite out of the first three was probably the first story The Square and this is probably because I read it first. If I had read one of the other two first, they might have been my favourite. But I liked the way all three stories explored the characters’ interior worlds through conversation and dialogue and when we think that there is nothing happening in the stories – there are no events, only conversations – we realize when we reach the end of the stories that a lot has happened in the characters’ interior worlds and the characters have undergone subtle and sometimes strong changes which have transformed them in very important ways. The way Marguerite Duras brings out the intensity of emotion and feeling of her characters not by describing them but through conversations and how through this conversational window she gives us a peek into the core of her characters’ hearts is a defining feature of all the stories. I loved this aspect of the stories. Have you read any of these four novels or any other books by Marguerite Duras? What do you think about them?